The Argentinian director Lisandro Alonso has developed a reputation for festival films in the ‘slow cinema’ mode. This means that his films are shown by leading festivals but struggle to get cinema releases in many territories. 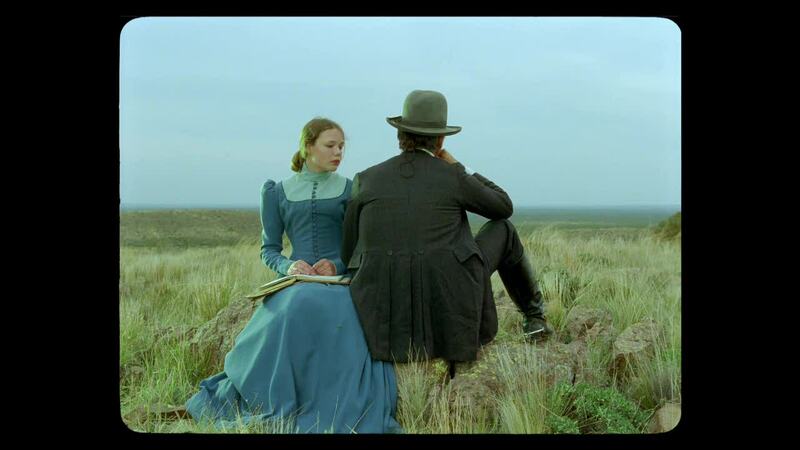 Jauja (his fifth feature) is a slightly different proposition since it stars the internationally-known Hollywood actor Viggo Mortensen (who is also credited as one of the producers and the music composer on the film). Perhaps because of this, Alonso has managed to attract funding and support from many sources including the US, Mexico, Brazil, France, Germany and the Netherlands. The film won the FIPRESCI critics prize at Cannes and two other international awards and certainly in the UK it has had a higher profile on release than the director’s earlier films. Mortensen plays Captain Dinesen, a Danish military engineer in the late 19th century who is assisting the Argentinian Army in their genocidal campaign to survey and ‘clear’ the ‘jungle’ – the desolate area in Patagonia sparsely populated by indigenous peoples. (The English word ‘jungle’ has connotations of tropical rainforest but its original Sanskrit/Hindi meaning is ‘arid wasteland’ – precisely describing parts of Patagonia.) He has with him his teenage daughter. It isn’t explained why she is there and her presence is disturbing for some of the soldiers. Almost inevitably she starts a relationship with one of them and the couple then run away from the camp. Forced to go looking for them, Mortensen’s character makes his own journey into the unknown. 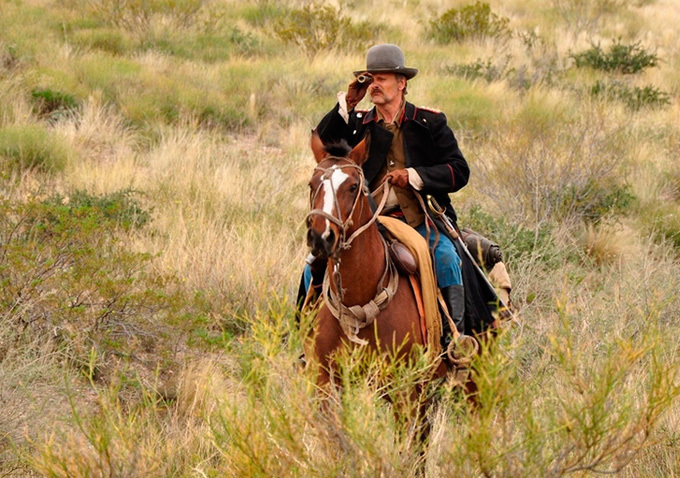 ‘Jauja’ refers to a magical place and at the beginning of the film a title explains this. In colonial ‘Latin America’ it became associated with similar concepts such as ‘El Dorado’. In this instance it seems to me that it refers to what might be termed the fantasy at the heart of the colonial melodrama. In some ways this film reminded me of Tabu, the Portuguese film which so captivated me in 2012. The two films aren’t necessarily the same in style, but there are some parallels about colonialism and both employ a time shift so we see characters in the present with links to the colonial past. In Jauja the link is not really explained but Viilbjørk Malling Agger, who plays Dinesen’s daughter, also plays a young woman in a country house in modern Denmark. Without spoiling the ‘plot’, I’ll simply note here that the Captain’s search for his daughter takes him to some odd places and some strange experiences. There are two linking motifs between the two time periods – a dog and a toy soldier. The search for a daughter (common I understand to several of Alonso’s stories) in the context of a ‘hostile territory’ in the 19th century brings to mind John Ford’s The Searchers (1956) in which John Wayne plays a Civil War veteran searching for his niece presumed abducted by Comanche raiders. Alonso selected the Finnish cinematographer Timo Salminen (best known for his work with Aki Kaurismäki) to shoot Jauja and Salminen is quoted as seeking a John Ford look for this quasi-Western. He appears to have come across the idea of an Academy (1.33:1) frame with rounded edges during post production and then imposed it on the 1.85:1 footage. The effect works particularly well because of the deep-focus compositions which stretch the gaze into the far distance – proving that barren spaces can be captured in depth as well as in the breadth of a CinemaScope image (see the article and interview with Mortensen by Mar Diestro-Dópido in Sight and Sound May 2015 plus the review of the film by Adrian Martin for more detail on this). The Academy framings also act as a reminder of Kelly Reichardt’s feminist revisionist Western Meek’s Cutoff (US 2010). I enjoyed Jauja and I found the various aesthetic devices and ideas about the colonial (mis)adventure both interesting and stimulating. I think the Danish connection came about because of the multilingual Mortensen’s interest in the script. Alonso and his co-writer Fabian Casas welcomed a different ‘voice’/language that would be ‘strange’ in an Argentinian film (i.e. not Spanish/French/Italian or English). The colonial past of Denmark is not so widely known as that of other European nations but it is an important element in Danish culture. Besides Greenland, the Faroes and Iceland, Denmark also possessed widely scattered small territories in the Caribbean and India and participated in the slave trade. Dinesen stands in for the European colonial adventurer while the Argentinians themselves are like the ‘settlers’ in North America and Australia who set out to eradicate indigenous peoples. The Argentinian Army officer in the film refers to ‘coconut heads’ – a made up name that Alonso thought would be strange but “not offensive” (see the interview in Sight and Sound). It sounds pretty offensive to me and I suspect to many others. Perhaps as the Luis Suarez racism charge suggests, these issues are rather differently dealt with in the Southern part of South America (i.e. Argentina, Chile, Uruguay)? So, what does the wider release mean for this ‘slow cinema’ film? I suspect that there has been a fair amount of bewilderment amongst the more mainstream arthouse audience. For my part I enjoyed the chance to gaze on the tableaux set up by Alonso and Salminen and to use the time to think about some of the issues. But I was aware that at the end of a long working day I was prone to losing concentration and potentially falling asleep. On the other hand, a big screen in a darkened cinema auditorium is also far more likely to hold my attention over the whole film than a small screen in my living room – when it is so easy to pause or switch off a DVD. 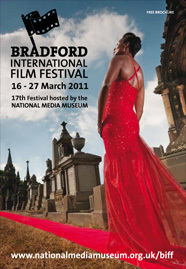 Festival films are meant to be seen in cinemas, even if many critics now watch them on much smaller screens. I also have Alonso’s Liverpool (2008) on disc – I wonder how that will work out? Some films deny classification. Le quattro volte has a cast of characters and a narrative of sorts. It starts and ends with sounds and images presenting the charcoal burners of the mountains of Calabria in the far south of Italy. In between there are effectively four linked ‘stories’. These do not directly refer to the four seasons but instead to the four elements: human, animal, vegetable, mineral. There is virtually no dialogue or music in the film, but plenty of natural sounds – a soundscape in the truest sense to match the stunning landscape. This is a ‘fiction’ and there may be some ‘acting’ but the events depicted are ‘real’ and have been practised for centuries. The difference between this film and ‘poetic documentary’ seems marginal. In terms of thematic and ‘tone’ you could describe the film as being an essay on tradition, spirit, folklore etc. Its style places it in the frame for ‘slow cinema’ – a concept analogous to ‘slow food’ – it takes time to say something but what you get has intense flavours and is deeply satisfying. Writer director Michelangelo Frammartino is a native of Calabria and in the fascinating Press Notes he explains that the philosophical underpinnings of the film derive from the work of Pythagoras (who taught in Calabria). Pythagoras introduced the idea of transmigration between human, animal, vegetable and mineral. In the image above the old goatherd in a mountain village takes an elixir made from the ashes produced in the local church – a form of pagan practise which he secretly follows thanks to the woman who tends the church. The goatherd is ‘watched over’ by his herd which in turn browses beneath the tree that provides the material for a village festival (another pagan event) and ultimately the basis for the charcoal and thus the ash. That’s more or less the cycle, but I’ve left out many of the interesting and on occasions emotionally charged events along the way. 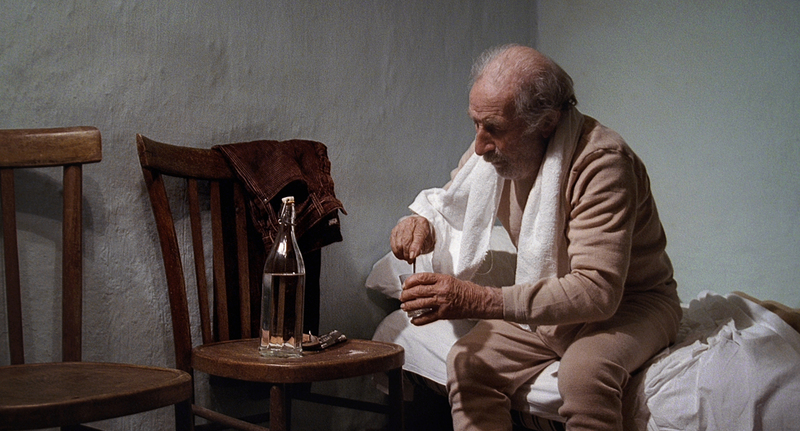 Frammartino’s mise en scène and camerawork is adaptable according to the needs of his narrative. At one moment we have a close-up of the old man’s face as an ant crawls across it. At other times the camera is high above the village watching everything down below in VLS (very long shot). In a truly stunning sequence, all in VLS, we see an Easter procession come out of the village and progress down the road, encountering the goatherd’s dog on the way in an elaborate comic playlet that could have come from silent cinema or in more recent times from an Elia Suleiman film. Le quattro volte is stunningly beautiful and a joy to experience, though I should warn those (like me) who are perhaps too sentimental that there is a very sad moment in the film. The film is scheduled to play at a few venues in the US in the next couple of months. In the UK it has been picked up by New Wave Films for release on May 27. I hope it turns out to be a ‘slow-burner’ – like the charcoal. It’s already one of my films of the year.